The recent STAR WARS movie, SOLO: A STAR WARS STORY, is intentionally made to look and feel like an American Western movie in outer space. In fact, the two scriptwriters, Lawrence Kasdan (the writer and director behind the classic Western SILVERADO) and his son, Jonathan, admit that was their intent. Reviewing SOLO reminded me of my all-time favorite Western movies. Westerns are, and will forever remain, my favorite film genre of all film genres, so that’s an added bonus. Westerns are among the most iconic genres in cinema. Their visual imagery, or iconography, consists of many things, including horses, six guns and holsters, men wearing iconic cowboy hats, leather boots with pointed toes to get into stirrups, shots of wide open spaces in the American West, Indians, steam engine trains, small American towns built of mostly wooden structures that include wooden walkways, small jails often built with stone to keep prisoners in one or two jail cells, cows being herded from one place to another on the American plains, etc. As John Cawelti (THE SIX-GUN MYSTIQUE) and many other scholars have noted, one way to analyze Westerns is by talking about how they depict the Western Hero and the Code of the West. Sometimes, the hero is a character of great shyness and gentleness, despite being a man of violence. Other times, the hero’s violent character is barely kept in check by social conventions or codes of personal honor. Even if he’s depicted as basically good, the Western Hero can still be seen as having flaws, some serious, some minor. Many Westerns affirm the view that true justice depends on the individual rather than the law, which is shown to be ineffectual against evil or lawless men. Often, the Western uses violence to affirm individualism but stops short of favoring anarchy by making the individual’s violent action an ultimate defense of the community against the threat of anarchy and evil. This is what seems to happen in Howard Hawks’ classic Western RIO BRAVO, where John Wayne is a professional lawman who, despite his protests to the contrary, gets help from his friends in the community to stop an evil rancher who has kidnapped the deputy, played by Dean Martin. Frequently, the Western Hero is an archetypal wanderer who is neither part of Civilization nor part of the vast landscape, or Wilderness, in which he roams. This gives many Westerns a tragic sense of loss. This was especially true of Director John Ford’s later Westerns THE SEARCHERS and THE MAN WHO SHOT LIBERTY VALANCE. As with the other genre categories, we can take a look at how different directors approach the Western. For example, we can learn a lot about how the movie medium conveys meaning by comparing the Westerns of John Ford with the Westerns of Howard Hawks, or by comparing the Western performances of John Wayne versus those of James Stewart, Gary Cooper, and Clint Eastwood. One of the first narrative movies, THE GREAT TRAIN ROBBERY of 1903, was a Western. Western movies became really popular during the Silent Era with heroic stars like Bronco Billy Anderson (the man who hired Charlie Chaplin), Harry Carey, Thomas S. Hart, Tom Mix, Tim McCoy, Hoot Gibson, and Fred Thompson, who was trained as a Presbyterian minister. In the 1930s, Hollywood sort of abandoned the Western film genre, which became relegated to B movie status. Silent stars like Tim McCoy and Hoot Gibson, among others, continued their Western work there, but the era saw new stars emerge such as William “Hopalong Cassidy” Boyd and Bob “Tex” Allen aka Ted Baehr, the father of MOVIEGUIDE® Founder and Publisher Dr. Ted Baehr. Bob Allen won the coveted Box Office Award in 1936 for his role in 1935’s LOVE ME FOREVER. After teaming up with Tim McCoy in a couple Westerns in 1935, he starred in six top Westerns of his own for Columbia Pictures in 1936 and 1937 (THE UNKNOWN RANGER, RIO GRANDE RANGER, RANGER COURAGE, LAW OF THE RANGER, RECKLESS RANGER, and THE RANGERS STEP IN) before the advent of the “singing cowboy,” which made Gene Autry the Top Western Star for six straight years from 1937 to 1942. The seminal movie year 1939 brought back the popularity of the “A” Western when John Wayne starred in John Ford’s acclaimed classic Western STAGECOACH, which led to such big hits as DESTRY RIDES AGAIN, DODGE CITY, JESSE JAMES, UNION PACIFIC, and 1940’s THE WESTERNER. Below is the list of my 10 favorite Westerns, limited to Westerns made during the sound era of movies. The list is based on entertainment and artistic value, especially what each movie brings to the Western genre and movies in general, including each movie’s place in cinema history. 1. THE SEARCHERS, 1956 – Quality: * * * * Acceptability: +1. Directed by John Ford, considered by some to be the best American movie director, THE SEARCHERS stars John Wayne as Ethan Edwards, an embittered former Confederate soldier who hates Indians, especially Comanche Indians because of the vicious things he’s seen them do to settlers and their families. Ethan and his young nephew search for a white girl kidnapped by a tribe of Comanches, who brutally murdered the girl’s mother, Ethan’s long-lost love who married Ethan’s brother when Ethan went off to fight the Civil War. Beautifully photographed, THE SEARCHERS is vastly entertaining and covers such topics as revenge, family, racism, trust, diligence, and redemption. In the movie, Director Ford sets up a series of repeated visual motifs that build to one of the most powerful emotional endings in any movie, not just in any Western. THE SEARCHERS is one of a few definitive Westerns with action-violence and clear redemptive themes of good versus evil. Ethan must overcome his own inner demons to become the hero his niece and nephew need him to be. 2. THE MAN WHO SHOT LIBERTY VALANCE, 1962 – Quality: * * * * Acceptability: +1. Another John Wayne movie directed by John Ford. This one, however, features Jimmy Stewart as a young lawyer, Ransom Stoddard, who comes into conflict with Lee Marvin’s title character, a cruel villain named Liberty Valance who terrorizes a town. Rance wants to use the law to stop Liberty’s reign of terror, but Wayne’s character, Tom Doniphon, tells Rance the only law Liberty respects and understands is the Law of the Jungle, the Law of a Gun. The conflict of ideas between Tom and Rance is the heart of the movie, and the movie’s last line, “Nothing’s too good for the man who shot Liberty Valance,” is one of the most bittersweet, elegiac lines of movie dialogue ever written, full of unspoken meaning. 3. RED RIVER, 1948 – Quality: * * * * Acceptability: +1. Directed by Howard Hawks (SERGEANT YORK and BRINGING UP BABY), RED RIVER also stars John Wayne in his first nuanced Western role as a tough trail boss named Tom Dunson, who comes into conflict with his adopted son, played by Montgomery Clift, who chafes at the cruel treatment his father metes out on the cowboys under his command during an arduous cattle drive. The key to understanding this movie’s wonderful but surprising and controversial character arcs and twists is a metal wristband that Tom gives to his woman just before he leaves a wagon train and just before she’s murdered by Indians. Tom retrieves the wristband from an Indian who attacks him after the raid on the wagon train. He then gives it to his adopted son, Matt, who in turn gives it to the woman he loves after he takes control of the cattle drive from Tom because Tom wanted to hang one of the cowboys on the drive. Wayne’s character learns that Matt gave her the wristband. Then, when Matt refuses at the end to have an armed duel with his father, Matt’s decision causes an unexpected result that makes his woman angry. “You better marry that girl,” Tom tells Matt after she gives the two men a tongue lashing. Clearly, despite their disagreement, Matt still honors and loves his adoptive father, and that helps alleviate and expiate Tom’s anger for what Matt did when he took away control of the herd from him. After seeing Wayne’s performance in this movie, John Ford reportedly told his friend, Hawks, “I didn’t know the [big guy] could act!” Of course, Ford used more colorful language to describe the impact of RED RIVER on Ford’s and the world’s impression of Wayne’s bigger-than-life talent. 4. SHANE, 1952 — Quality: * * * * Acceptability: +1. SHANE is one of the most iconic Westerns ever made and certainly one of the most beautifully photographed. Directed by the great George Stevens (GUNGA DIN, THE GREATEST STORY EVER TOLD, and I REMEMBER MAMA), SHANE stars Alan Ladd as a gunfighter who helps a farmer and his wife (played by the great Jean Arthur), who are being threatened by a cattleman and his hired gunman, played by Jack Palance in his most iconic bad guy role. Shane befriends the couple’s young son, who grows to idolize Shane, at the expense of the boy’s own father. The gunfight scenes in SHANE are gritty and powerful, but classic. Their gritty impact is probably because of the horrors of war that George Stevens experienced and witnessed as a war photographer in Europe during World War II. The analysis of SHANE by scholar John Cawelti in his book THE SIX-GUN MYSTIQUE is a brilliant explanation of why people love Westerns like SHANE and the other movies on this list and many other lists. 6. THE MAGNIFICENT SEVEN, 1960 – Quality: * * * * Acceptability: +1. Directed by John Sturges, THE MAGNIFICENT SEVEN is probably everyone’s favorite 1960s Western, with an extremely memorable musical score by Elmer Bernstein. The story comes from Akira Kurosawa’s epic Japanese movie THE SEVEN SAMURAI. 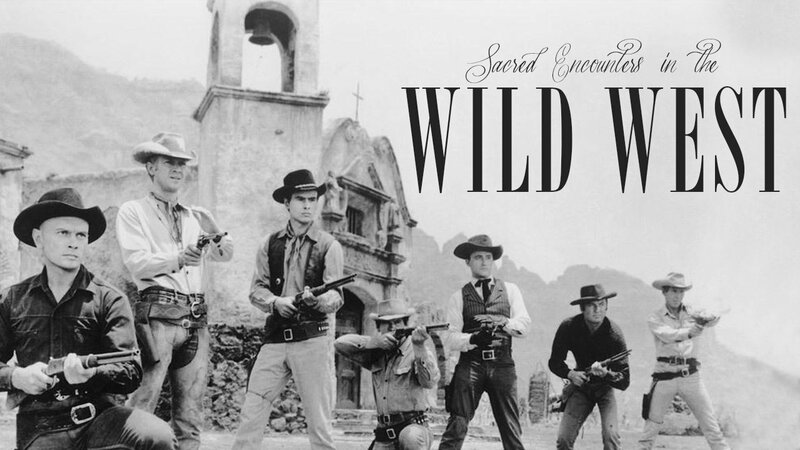 In this Westernized version, a poor Mexican village oppressed by bandits, led by a villain played by Eli Wallach (HOW THE WEST WAS WON and THE GOOD, THE BAD AND THE UGLY), hires seven gunfighters to stand against the bandits. The gunfighters are played by several truly iconic 1960s Hollywood megastars, including Yul Brynner, Steve McQueen, Charles Bronson, and James Coburn. It’s truly a rousing story of peasants and conflicted heroes down on their luck taking a stand against ruthless tyranny. In the end, as in the Japanese original, the surviving gunfighters realize that the farmers are the real enduring winners because they belong to the land and have families to protect. As Charles Bronson’s character tells one of the young boys in the village, who’s ashamed their fathers are cowards, “Don’t you ever say that again about your fathers, because they are not cowards. You think I am brave because I carry a gun; well, your fathers are much braver because they carry responsibility, for you, your brothers, your sisters, and your mothers. And, this responsibility is like a big rock that weighs a ton. It bends and it twists them until finally it buries them under the ground. And, there’s nobody says they have to do this. They do it because they love you, and because they want to. I have never had this kind of courage.” This is one of the most magnificent, memorable pieces of dialogue in all of cinema. 7. RIO BRAVO, 1959 – Quality: * * * * Acceptability: +1. Directed by Howard Hawks, RIO BRAVO is an iconic Western that gives viewers a strong moral foundation for the law and order around which the American Western film genre usually revolves. John Wayne plays John T. Chance, a sheriff who keeps trying to discourage other people in the town from helping him hold off a cattle baron from rescuing his brother, whom Chance has arrested for murder. The townspeople, including a lady gambler who just arrived in town, keep ignoring his advice and help Chance and his deputies when they need their help the most. Thus, the movie intentionally makes the point that establishing law and order doesn’t just take an honest sheriff and his men, it takes a whole community standing behind them. After all, if the community won’t support its law enforcement officers, then the community itself will be lost. RIO BRAVO contains three great, surprising performances, one by Angie Dickinson as John Wayne’s love interest who refuses to be taken for granted, the great Walter Brennan as an old cripple who provides the logistics support (and lots of comic relief) for the sheriff and watches the jail while Chance and his deputy patrol the town, and Dean Martin as the deputy, who’s become a drunken bum after a woman breaks his heart and tarnishes his manhood. Of course, Wayne binds them all together, but his job here is to make them look good. A great companion piece to RIO BRAVO is the hilarious 1967 Western EL DORADO, also directed by Howard Hawks, where John Wayne plays the friend of a sheriff played by Robert Mitchum, who’s become a drunken bum after having girl troubles, just like Dean Martin’s deputy in RIO BRAVO. It’s Mitchum here who shines, but a young James Caan delivers a funny, very appealing performance as the partner of a murdered riverboat gambler whom Wayne befriends along the way, almost like a son. 8. THE FAR COUNTRY, 1954 — Quality: * * * * Acceptability: +1. In the 1950s, Jimmy Stewart made a series of Westerns with Director Anthony Mann that represented a darker version of Stewart’s Everyman hero in movies like MR. SMITH GOES TO WASHINGTON and DESTRY RIDES AGAIN, which is a great Western in its own right. My favorite is THE FAR COUNTRY, where Stewart plays a cowboy looking to strike it rich with his longtime friend, played by Walter Brennan. When they travel to a boomtown in Alaska to bring a herd of cattle for the starving gold miners there, they run into a shady lawman played by John McIntyre, who legally steals their cattle and then illegally steals their gold claim while damaging Stewart’s gun hand and committing a heinous murder. The stage is set for an exciting, intense showdown where Stewart gets the girl, but not the girl he thought he’d get. THE FAR COUNTRY is a great Western with a lot of heart and a despicable, smooth-talking villain who brings cheers when he meets his well-deserved demise. 9. SILVERADO, 1985 – Quality: * * * * Acceptability: -1. Written and directed by veteran STAR WARS scribe Lawrence Kasdan, SILVERADO is one of those great Westerns that’s just super-fun to watch. Kevin Kline plays a former bank robber who teams up with three good guys, including a black man who’s a dead-eye shot and who wields a rifle like a Jedi Knight’s lightsaber, to help a farmer and his family who are being oppressed by a cattle baron and the town sheriff, who just happens to be Kevin Kline’s former boss. In SILVERADO, Kasdan takes familiar Western tropes and formulas and gives them new energy. Kline makes a perfect hero, as do Danny Glover, Scott Glenn, and Kevin Costner as Glenn’s goofy but likeable younger brother, the role that made Costner an actor to watch. Besides TOMBSTONE, the movie about the Gunfight at the O.K. Corral starring Kurt Russell as Wyatt Earp, SILVERADO is the last of the great classic Westerns. Most of the Westerns after it are much darker. 10. THE GOOD, THE BAD, AND THE UGLY, 1967 – Quality: * * * * Acceptability: -1. An Italian Western directed by Sergio Leone featuring a great score by Ennio Morricone. Clint Eastwood, Eli Wallach, and Lee Van Cleef play three gunslingers seeking a cache of stolen Confederate gold buried somewhere in a cemetery for safe keeping. Lee Van Cleef plays one of the most evil, merciless gunslingers ever invented, while Eli Wallach delivers a crazy but touching performance as Tuco, a Mexican bandit with an estranged brother in the priesthood. The poignant scenes between Tuco and his brother, and the heartrending scenes with a drunken Union officer who drinks to numb himself against the carnage of war contain a moral, spiritual, and psychological depth not often seen in many Spaghetti Westerns, or any other Western for that matter. Scenes set in a POW camp run by Lee Van Cleef’s “Angel Eyes” character contain light allusions to Hitler’s concentration camps. A group of Confederate soldiers forced to use musical instruments to play a song to cover up the sounds of Tuco being brutally beaten by Angel Eyes and an evil sergeant is quietly heartbreaking as Leone’s camera lingers over the face of one of the Confederate soldiers, who’s trying to stave off his tears but fails. In the end, Eastwood’s “good” character decides that he alone must see that Angel Eyes gets his just desserts and that Tuco must earn his share of the loot in one final trial. Some critics cite Leone’s ONCE UPON A TIME IN THE WEST, with Charles Bronson, Henry Fonda, and Claudia Cardinale, as a much better Western, perhaps the best ever made, but the characters and story in THE GOOD, THE BAD, AND THE UGLY are much more entertaining and thrilling.